Saad Amrani is the Chief Commissioner of the Belgian Federal Police. He is a leading advocate in the European community’s fight against radicalization and ISIS and is in charge of securing European summits and other international high-level meetings, maintaining public order at demonstrations. Since 2015, he has led a joint project between the Moroccan and Belgian police on radicalization issues. Ambassador Alan Baker is the director of the Institute for Contemporary Affairs at the Jerusalem Center for Public Affairs and the head of the Global Law Forum. He participated in the negotiation and drafting of the Oslo Accords with the Palestinians, as well as agreements and peace treaties with Egypt, Jordan, and Lebanon. He served as legal adviser and deputy director-general of Israel’s Ministry of Foreign Affairs and as Israel’s ambassador to Canada. From 1994 to 2017, Volker Beck was a member of the Bundestag, the German federal parliament, for the Green Party. Beck served as the Green Party Speaker for Legal Affairs from 1994–2002, and as the Green Party Chief Whip in the Bundestag till 2013. He was spokesman of the Green Parliamentary group for interior affairs and religion. In 2014 he was elected president of the German-Israeli Parliamentary Friendship Group of the German Bundestag. A veteran Arab affairs and diplomatic commentator for Israel Radio and Television, Yoni Ben Menachem is a senior Middle East analyst for the Jerusalem Center. He served as director general and chief editor of the Israel Broadcasting Authority. Entrepreneur and manager Marco Carrai is the chairman of Toscana Aeroporti S.p.A., chairman and founder of CyS4, a cybersecurity company, and a member of the Board of Directors of the banking foundation Ente Cassa di Risparmio di Firenze. He has served as city councilor of the city of Florence. He served as the chair of the secretary of the president of the Florence Province and as economic adviser to the mayor of Florence. He is a member of the Advisory Board of Università di Roma LUMSA and of Università Ca’ Foscari Venezia. Ignacio Cosidó Gutiérrez is a Spanish Senator (Popular Party), chairman of the Demographic Committee, amember of the National Security and Defense Committees, and a member of the OSCE Parliamentary Assembly. From 2012 until 2016, he served as director-general of the National Police Force of Spain. He has served as a member of the National Parliament also between 2004–2012. An air force reservist lieutenant, he is Associate Professor in IE University (Madrid), vice president of the Atlantic Association, and a member of the Strategic Studies Group (GEES). Dan Diker is director of the Political Warfare Project at the Jerusalem Center for Public Affairs. A former director general of the World Jewish Congress, he is also a Research Fellow at the International Institute for Counter Terrorism at IDC, Herzliya. Ambassador Freddy Eytan, a former Foreign Ministry senior adviser who served in Israel’s embassies in Paris and Brussels, was Israel’s first Ambassador to the Islamic Republic of Mauritania. He was also the spokesman of the Israeli delegation to the peace process with the Palestinians. Since 2007, he heads the Israel-Europe Project at the Jerusalem Center, which focuses on analyzing Israeli relations with the countries of Europe and seeks to develop ties and avenues of bilateral cooperation. He is also the director of Le Cape, the Jerusalem Center website in French. Amb. Eytan has written 20 books about the Israeli-Arab conflict and the policy of France in the Middle East, including La Poudriere (The Powder Keg) and Le Double Jeu (the Double Game). He has also published biographies of Shimon Peres, Ariel Sharon, Benjamin Netanyahu, and a book, The 18 Who Built Israel. From September 2017, Emanuele Giaufret has served as the head of the delegation of the European Union to the State of Israel. From 2013 to 2017 he served as the head of the Division for Democracy and Electoral Observation of EEAS (European External Action Service – the diplomatic service and foreign and defense ministry of the European Union). Prior to that task, he served as assistant to the managing director for North Africa and the Middle East, head of the Section of the EU delegation to the UN in New York, Counsellor/First Counsellor, and First Secretary of the DCM EC delegation in Tel Aviv. He holds a PhD in History of International Relations from the University of Florence (Italy) obtained in 1999 and a Master’s degree in European Affairs received from the College of Europe (Bruges, Belgium) in 1996. He graduated in political science from the University of Florence (Italy) in 1993. Ambassador Dore Gold has served as president of the Jerusalem Center for Public Affairs since 2000. From June 2015 until October 2016, he served as director-general of the Israel Ministry of Foreign Affairs. Previously, he served as foreign policy adviser to Prime Minister Benjamin Netanyahu, Israel’s Ambassador to the United Nations (1997–1999), and as an adviser to Prime Minister Ariel Sharon. François Heisbourg is the chair of the International Institute for Strategic Studies (IISS) Council. Prof. Heisbourg began his career in the policy planning division of the French Foreign Ministry and was subsequently first secretary at the French Permanent Mission to the United Nations (New York) and a security adviser to the Minister of Defense. In 1984, he moved into the private sector as vice president at Thomson-CSF, serving as director of the IISS in 1987, before joining MATRA-Defense-Espace as Senior Vice-President in 1992. He has served on several French government advisory bodies, leading the interagency working group on the study of international relations, strategic affairs, and defense issues in France (1999–2000), serving as a member of the “Defense and National Security White Paper” Presidential Commission (2007–2008, 2012–2013); and on the steering committee for the White Paper on Terrorism (2005–2006). Chaya Herskovic is the director general of the Jerusalem Center for Public Affairs since 2004. She has served since 1988 as the Jerusalem Center’s director of projects, responsible for the organization and management of numerous Jerusalem Center research projects, conferences, and seminars in a variety of fields including privatization, education, law enforcement, local government, Israel’s political system, and the Druze minority. She has also been responsible for the editing and production of the Center’s Hebrew publications. Pinhas Inbari is a JCPA expert on Middle East affairs. A veteran Palestinian affairs correspondent who formerly reported for Israel Radio and Al Hamishmar newspaper, he currently reports for several foreign media outlets. Brig.-Gen. (res.) Yossi Kuperwasser is director of the Project on Regional Middle East Developments at the Jerusalem Center. He was formerly director-general of the Israel Ministry of Strategic Affairs and head of the Research Division of IDF Military Intelligence. An Israeli journalist with the daily newspaper Yisrael Hayom, Lord’s articles and essays about media, film, and politics have been published in The Jerusalem Post, Mida, Azure, Nativ, and Achshav. Lord wrote and anchored a TV series about the beginnings of Israeli cinema. He is the author of The Israeli Left: From Socialism to Nihilism (2003), a political and historical analysis of the Israeli Left from a personal perspective. Ambassador Zvi Mazel served as Israel’s ambassador to Sweden between 2002–2004. From 1989 to 1992, he was Israel’s ambassador to Romania and from 1996 to 2001 Israel’s ambassador to Egypt. He has also held senior positions in Israel’s Foreign Ministry as deputy director-general in charge of African affairs and director of the Eastern European division and head of the Egyptian and North African department. Col. (ret.) Dr. Jacques Neriah, a regular contributor to the Jerusalem Center’s blog on the upheavals in the Arab world, was formerly foreign policy adviser to Prime Minister Yitzhak Rabin and Deputy Head for Assessment of Israeli Military Intelligence. An award-winning journalist and author, leading columnist for Il Giornale, an Italian daily, Fiamma Nirenstein is currently a senior fellow of the Jerusalem Center for Public Affairs, in charge of the European Project. For the Jerusalem Center, she has edited the book Lessons from Israel’s Response to Terrorism. Between 2008 and 2013, she was a member of the Italian Parliament, serving as vice-president of the Committee on Foreign Affairs of the Chamber of Deputies. During her term, she established and chaired the first Parliamentary Committee for an Inquiry into anti-Semitism. Nirenstein is an expert in Middle East, human rights, terrorism, and anti-Semitism and has written 13 books on these issues. Nirenstein is a Selection Committee Member of the Genesis Prize, a fellow of the Gatestone Institute, a member of the Advisory Board of NGO Monitor, and a board member of the European Friends of Israel (DFI). She is also one of the six founding members of the steering committee of the Interparliamentary Coalition on Combating Anti-Semitism (ICCA). She serves on the Board of the Friends of Israel Initiative, established in 2010 by the former prime minister of Spain, José Maria Aznar. She is also a board member of the “Talmud Project,” a major initiative sponsored by the Italian government to translate the Babylonian Talmud into Italian. Jennifer Roskies works at the Jerusalem Center for Public Affairs as chief of staff. She was senior adviser to Dore Gold in the Director General’s Bureau during his tenure at the Foreign Ministry. Prior to that, she was involved in academic research, development, and communications. Tomas Sandell is a founding director of the European Coalition for Israel, which is the only non-Jewish pro-Israel advocacy group accredited to the European Union. 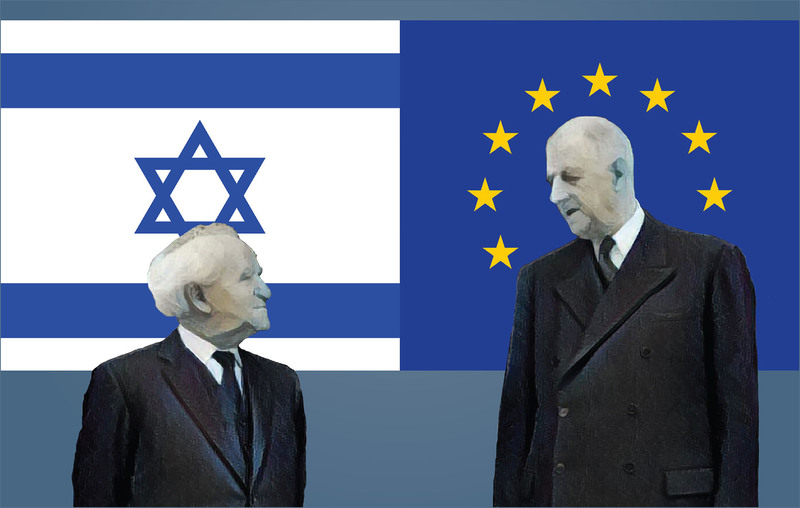 The Coalition was formed in Brussels in 2003 in order to combat anti-Semitism in Europe and promote better relations between Europe and Israel. Since 2013, the Coalition is also active at the United Nations in New York through the new initiative, Forum for Cultural Diplomacy. Before getting involved in pro-Israel advocacy, Mr. Sandell was an accredited journalist at the European Union in Brussels, writing primarily for the Scandinavian market. However, his articles have also appeared in international media outlets such as The Wall Street Journal, International Herald Tribune, Jerusalem Post, etc. While in Brussels he was also involved in leadership training and in forming a pan-European network for development and relief organizations. A JCPA expert on Middle East affairs, Michael Segall has provided ground-breaking analysis of Iranian military strategy and tactics for the Jerusalem Center, and has written extensively about Iranian penetration of Latin America and Africa. Brig.-Gen. (ret.) Dr. Shimon Shapira, who served as the military secretary to the prime minister and as Israel Foreign Ministry chief of staff, edited the Jerusalem Center eBook Iran: From Regional Challenge to Global Threat. William Shawcross, a journalist, author, and broadcaster, served (2012 – 2017) as chairman of the Charity Commission for England and Wales – the non-ministerial government department that regulates registered charities in England and Wales and maintains the Central Register of Charities. He has worked as a journalist for The Sunday Times, and he writes and lectures on issues of international policy, geopolitics, Southeast Asia and refugees for a number of publications, including Time, Newsweek, International Herald Tribune, The Spectator, The Washington Post and Rolling Stone. He has also written a number of books, including biographies of Rupert Murdoch, the Shah of Iran, and the official biography of Queen Elizabeth, the Queen Mother (2009). Shawcross was Chairman of ARTICLE 19, the international center on censorship, from 1986 to 1996. He was a member of the Council of the Disasters Emergency Committee from 1997 to 2002, and a board member of the International Crisis Group from 1995 to 2005. He was a member of the UN High Commissioner for Refugees’ Informal Advisory Group from 1995 to 2000. From 1997 to 2003, he was a member of the BBC World Service Advisory Council. In 2011 he joined the board of the Anglo-Israel Association and was appointed to the board of the Henry Jackson Society. Professor Gerald Steinberg is founder and president of NGO Monitor and professor of Political Studies at Bar Ilan University. He is the founder of the Program on Conflict Management and Negotiation at Bar Ilan University. His research focuses on the changing nature of power in international relations, as reflected in Middle East diplomacy and security, the politics of human rights non-governmental organizations (NGOs), and Israeli politics and arms control. He was awarded a prestigious Israel Science Foundation grant (2008); served as team leader, Israel at the Polls chapters on the peace process and Israel-American relations (1988–2005); member of Israel Council of Foreign Affairs; advisory board of the Israel Law Review International; appointed to the Israel Higher-Education Council, Committee on Public Policy (2013); academic participant in the Inter-parliamentary Coalition for Combating Antisemitism ICCA. His op-ed columns have been published in The Wall Street Journal (Europe), Financial Times, Ha’aretz, Jerusalem Post, and other publications. He has appeared as a commentator on BBC, CNN, MSNBC, Al Jazeera, and NPR. Dr. Yuval Steinitz is the minister of National Infrastructure, Energy, and Water. He completed his IDF service in the Golani Brigade. He holds a B.A. and M.A. (with honors) in philosophy from the Hebrew University of Jerusalem, and a Ph.D. in philosophy from Tel Aviv University. Steinitz was a senior lecturer in the Philosophy Department at Haifa University. A member of Knesset since 1999, Steinitz has served as a member and chairman of the Foreign Affairs & Defense Committee, and as a member of the Constitution, Law and Justice, and the Science and Technology Committees. He chaired the Committee for the Examination of the Intelligence Services Following the War in Iraq. Since 2003 he has co-chaired the Joint Congress-Knesset Security Committee, together with Senator John Kyl (Arizona). Yuval Steinitz was appointed minister of Finance in March 2009, serving until March 2013, when he was appointed minister of Strategic and Intelligence Affairs responsible for International Relations. In May 2015, he was appointed minister of National Infrastructure, Energy, and Water. Ambassador Giulio Terzi di Sant’Agata has served in the Italian Foreign Service between 1973 and 2013 in different capacities. He has been political director, ambassador to Israel, permanent representative to the United Nations in New York, ambassador to the United States, and was appointed in November 2011 as foreign minister until March 2013. He is currently active on issues of foreign and security policy as a senior adviser or board member in relevant institutions and organizations. Dr. Tommaso Virgili works at the Brussels-based policy center European Foundation for Democracy, where he specializes on a number of projects related to European policy, prevention of radicalisation, and Islamism. He has previously held posts at the European External Action Service (covering Egypt, Syria, Lebanon, and Jordan), the Middle East Forum in Philadelphia and the Italian Permanent Mission to the United Nations in New York. Tommaso holds a Ph.D. in Comparative Law focused on Islamic Constitutionalism, Sharia and Individual Liberties from Sant’Anna School of Advanced Studies in Pisa, obtained further to a Master of Arts in Middle East, Islamic Studies, and Arabic from the American University of Paris and Cairo.